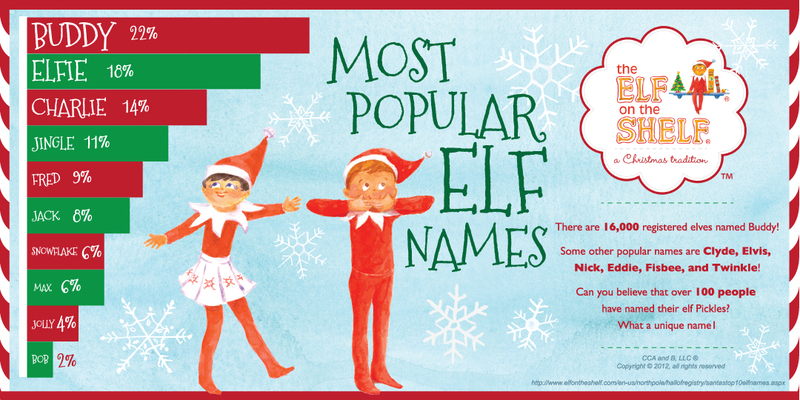 If you have little ones in your life, you’re probably aware of Elf on a Shelf (affiliate link). I’ve noted that Elf on a Shelf is actually better than an advent calendar because it’s a nice way to count down to Christmas that doesn’t involve daily candy and/or small presents. The problem, of course, is that in order to keep the “magic” of the elf going, you have to be diligent about moving the elf from spot to spot around your house from the day after Thanksgiving until Christmas day. And if you travel during this time period, the elf has to show up wherever you are. Because he’s magic, and he knows how to find his family each morning when he comes back from giving his report to Santa each night at the North Pole. So, I guess what I’m saying is that the elf stresses me out. The honeymoon is over. He’s a lot of responsibility. And if you screw up, you can totally ruin the magic of Christmas. G is 7 now and is able to figure this thing out with one small slip up. Plus, let’s face it, the elf is a tad bit creepy looking. 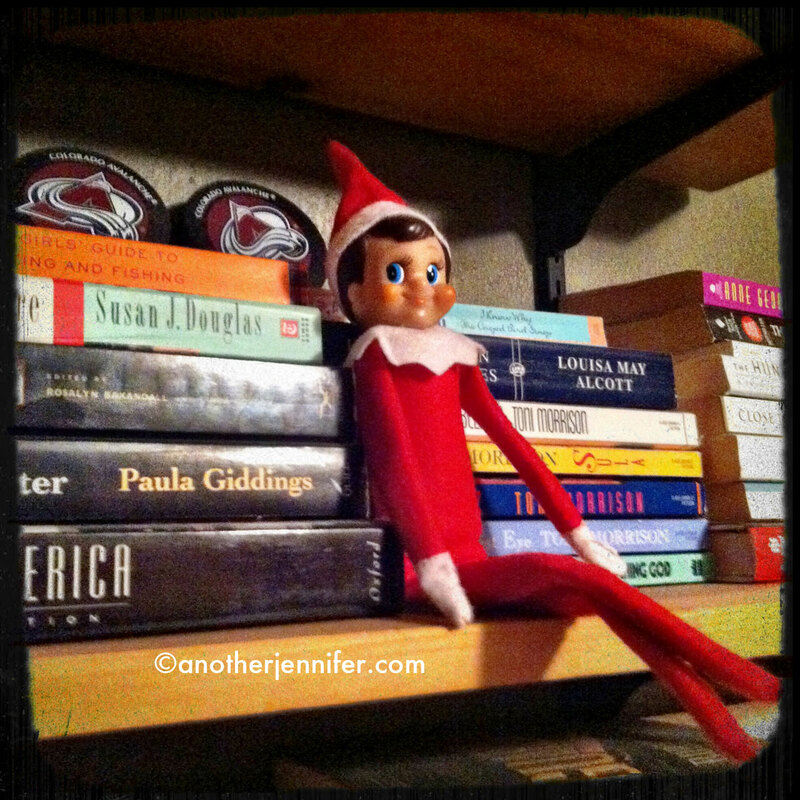 Our “Elfie” on the shelf. He likes books. Now, don’t get me wrong, the Elf on a Shelf has its merits. It is a cute idea (that I totally wish I had), and you can use the elf as leverage when your kids aren’t behaving as well as you’d like. Our elf is named “Elfie.” We are clearly not that creative in the elf-naming department. It’s just that the websites and blogs that are all about being “creative” about your Elf on the Shelf are kind of killing me right now. I’m not the type that will stage an elf doing some sort of “naughty” thing, whether it’s good or bad. Actually, that last one is totally worth visiting. Do you have an Elf on the Shelf? Do you get creative or are you just lucky to remember to move it? I keep making up reasons why he’s not here yet…. better get on that one. Chris Carter recently posted..I Am A Guest!! I have a good friend who does this, and it looks like soooo much fun! For her and for her girls. It does seem like a ton of work, though. Since my little guy is still so young, probably wouldn’t need to decide / start it until next year. I am so thankful that the Elf didn’t make his (I can only think of it as male but have no verification!) appearance until after my boys were too old to partake in what appears to be a delightful holiday tradition! I’ll send these thoughts onto my daughter-in-law though before she starts something with Ben that she may come to regret! You’re lucky, Patti. It’s a great idea and the boys love it, but it’s stressful! And our elf is a boy, but they now make girls too. Still kinda creepy! Ha ha ha, I’m so glad I’m not the only mom who forgets to move the Elf! We forgot so many times last year, but luckily the kids were small enough we could tell them anything (he must have been really comfortable there! or he must have fallen asleep and forgotten to go back to Santa last night!) and they bought it. I think this year we will not be able to fool them. So thanks for the tips – I will check those out to have a more successful Elf experience this year!! It was much easier when the boys were younger. Now that G’s 7, it’s hard to get anything by him. The whole “Looks like Elfie was comfortable in that spot” to cover not moving him doesn’t work as well! I don’t know… The Elf on the Shelf thing seems a little bit like tattling to me. Like – if you mess up, the Elf is going to tell on you! We never had one growing up, but we did have Advent Calendars. And I agree, he is a little scary/creepy!! It’s totally like tattling! There’s definitely kind of a mean aspect to the elf, which parents can totally work to their advantage….until they figure out the whole Santa thing. You’re good. You are. I don’t have an elf. It’s not an expectation in my house – which is a blessing in disguise I would totally forget to move it! Is the elf creepy looking or is it that he reminds me of those calymation Christmas specials from when I was young – or were those claymation figures just pain creepy looking? Yeah. Those claymation characters were kind of creepy too! That little face IS a little creepy looking. He’s got a little evil twinkle in his eye. Ahhhhh, the things we do for our kids.